A fascinating 17th century pre-Cook speculation on the configuration of northwestern America. Carte Generale Des Decouvertes de L'Amiral de Fonte representant la grand porbabilite d'un Passage Au Nord Ouest par Thomas Jefferys Geographe du Roi a Londres 1768. A truly fascinating 1772 map of the northwestern parts of North America by Robert de Vaugondy and Thomas Jefferys. Essentially depicts the north eastern parts of Asia, speculations on northwestern America, and Admiral De Fonte's mythical conception of a Northwest Passage. Heavily based upon earlier work by Thomas Jefferys, Thomas Swaine Drage, Gerhard Muller, and James De Lisle. Vaugondy prepared this map prior to the voyages of James Cook to this region. Around this time Europe was rampant with speculation both regarding the existence of a Northwest Passage and the northwestern parts of America in general. The discoveries of Admiral de Fonte and Juan de Fuca though now known to be entirely mythical, inspired the European imagination. Barthlomew de Fonte was supposedly a Spanish Admiral who, sailing up the Pacific coast c. 1640 discovered a series of gigantic lakes, seas, and rivers heading eastward towards the Hudson Bay. Supposedly, upon one of these great inland lakes, he met with a ship from Boston that claimed to have come through a Northwestern Passage. De Fonte's story appeared in a short lived 1706 English publication entitled 'Memoirs of the Curious.' The story inspired no less than Joseph-Nicholas de L'Isle, younger brother of the better known Guilleme de L'Isle. Joseph-Nicholas, at the time, was employed by the Russian Tzar Peter the Great in the compilation of Russian surveys and discoveries in Siberia and the extreme northeast of Asia. When he published his somewhat accurate map of northeast Asia, he paradoxically decided to include with it an entirely speculative map of North America based largely on De Fonte's letter. 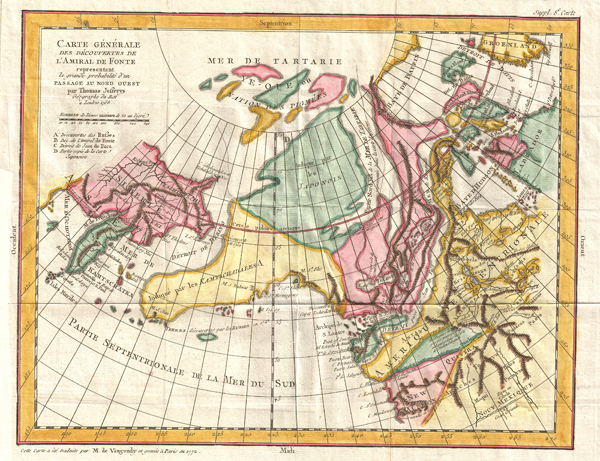 De L'Isle's mantle was later taken up by Jefferys, another ardent supporter of the De Fonte Northwest Passage theory, in his own map of the region, which was, ultimately, the inspiration for this map by Vaugondy. In accord with De Fonte's suggestions this map displays the strait of Juan de Fuca continuing inland past the large lakes of Velasco, Belle and De Fonte to communicate with the Baffin and Hudson Bay. There are also a series of rivers and waterways connecting the lakes themselves to an outlet in the Arctic. Based upon Russian reports, Vaugondy renames the 'Straits of Ainan,' the 'Detroit de Bering,' paying homage to the great Russian navigator. Anian itself has been moved southward nearer to the Strait of Juan de Fuca. Anian is a term derived from a John Donne poem, 'Anyan if I go west by the North-West passage.' However, it was interpreted as the Bering Strait by cartographers, successfully transitioning it from the realms of poetry to cartography. Anian presupposed the existence of a Northwest Passage and, as such, was entirely mythical, though the lands that are now Alaska long bore that name. Further south still we find Quivira, one of the legendary northern American Kingdoms of Gold. Nearer to Russia the Aleutian Islands have been consolidated into a large peninsular landmass extending eastward towards Asia. In the extreme north, between 80 and 60 degrees of latitude is an archipelago, presumably discovered by Japanese sailors marooned in Kamtschatka, and purportedly inhabited entirely by pigmies. An altogether fascinating map of the Northwest Passage and the American west and a must for any serious collection dedicated to this region. Prepared by Vaugondy as plate no. 8 for the Supplement to Diderot's Encyclopédie. Very good condition. Original folds. Wide clean margins. Original platemark visible. Blank on verso.